the Neanderthal men of tomorrow. The subsequent biographical details are mainly taken from Hoimar von Ditfurth's books Innenansichten eines Artgenossen and Das Gespräch. Some details have been researched by me from other sources. See German Biographie page for more information. Hoimar Gerhard Friedrich Ernst von Ditfurth was born on October 15, 1921 in Berlin (Charlottenburg). He originated from the family of the national conservative Prussian cavalry captain (Rittmeister) and later classical teacher Hans-Otto von Ditfurth. Until his first day in school in Potsdam, Hoimar von Ditfurth lived in Berlin and Lensahn. 1949 he married Heilwig von Raven. 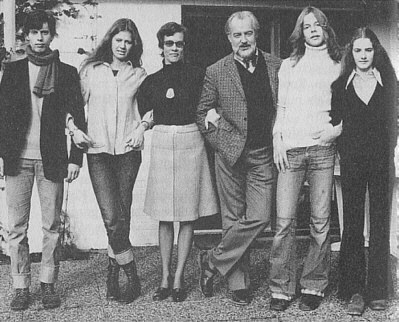 Together they had four children: Jutta (*1951), Wolf-Christian (*1953), Donata-Friederike (*1956) and York-Alexander (*1957). Hoimar von Ditfurth died on November 1, 1989 in Freiburg/Breisgau of a thymom (cancer of the thymus gland). He is buried in Staufen. 1939 Hoimar von Ditfurth graduated from the Viktoria-Gymnasium (college) in Potsdam. Afterwards he studied medicine, psychology and philosophy at the universities of Berlin and Hamburg, where he attained his Ph.D. in medicine in July 1946. Between 1948 and 1960 Hoimar von Ditfurth worked at the university hospital in Würzburg (in the end as senior physician). 1959 he qualified himself as a university lecturer there and became outside lecturer for psychiatry and neurology. 1967 and 1968 he was appointed associate professor of the medical faculty at the universities of Würzburg and Heidelberg. 1960 Hoimar von Ditfurth took a job in the pharmaceutical company C. F. Boehringer in Mannheim, where he managed the "Psycho Lab" being responsible for the development and clinical testing of psycho drugs. Although Hoimar von Ditfurth was offered a position in the board of executives, he left Boehringer in 1969 ("...I don't want to sacrifice my intellectual independence...") and became a freelance lecturer, publisher, author and one of the most distinctive science journalists in Germany. Hoimar von Ditfurth's popularity in Germany is based on numerous articles in newspapers, radio broadcasts (between 1963 and 1983), and TV shows (between 1971 and 1983) with various popular scientific subjects. 1970 his first book, Children of the Universe (= Kinder des Weltalls), was published. This and his following books made him the most competent and best selling scientific writer in Germany - about a million copies of his paperbacks alone were sold in German speaking countries. Many of his books were translated into other languages. See German Bücher page for more details about his publications. He also was editor and publisher of miscellaneous scientific magazines, publications and samplers (e. g. Mannheimer Forum) to which many famous national and international scientists provided contributions. Between 1971 and 1983 Hoimar von Ditfurth hosted the popular TV science show Querschnitte (= cross-sections) in which he showed his extraordinary talent to make complex scientific contents understandable to a broad audience. One of his major targets always was to position natural science equally besides arts science which he thought is overrated in the western cultural society. He was also a committed and eloquent fighter against all kinds of superstition and obscure "pseudo science". An essential part of his life works was the fight against an anthropocentric attitude and against a pure creationistic view of the world. Starting in the late 70s, Hoimar von Ditfurth concentrated more and more on ecological subjects. He became a critic of the western "credo in progress and economical growth". Even though he proclaimed that mankind would destroy itself by environmental pollution and destruction, overpopulation and (nuclear) armament, he never was a fatalist. He always maintained his hope and true humanistic approach. Hoimar von Ditfurth was a committed pacifist. In the 80s he supported the German Green Party during their election campaigns, but without getting involved in political activism and always keeping a critical distance to extreme ideological positions. Hoimar von Ditfurth was a member of the German PEN-Center and holder of numerous national and international awards and prizes (see German Biographie page for more details). 1980 he received the UNESCO Kalinga-Prize for his lifetime achievements as author and publisher. Explore lost civilizations, ancient ruins, sacred writings, unexplained artifacts, and science mysteries. Introduced are subject matter experts, books, and resources on the Internet. Biographical details about Hoimar von Ditfurth on that website are provided by me (same as on this page). Translation © 2001 by Heinz Boente (pokypsi WEB DESIGN). Unauthorized reproduction of text prohibited, please contact me to obtain permission. Thanks.